Indiana freshman, Luke Fischer, has made a decision that has shocked everyone around college basketball. 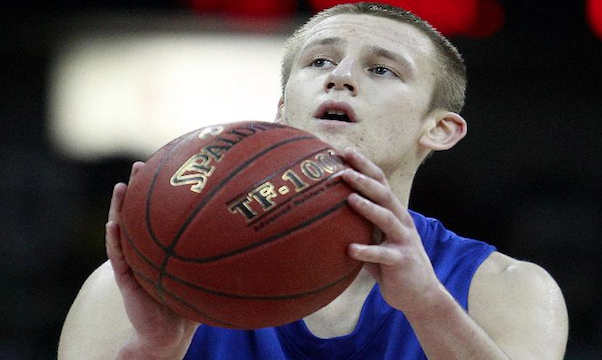 A former Mr. Basketball and Gatorade Player of the Year in the state of Wisconsin, and a top-100 recruit coming out of high school, Fischer has decided to transfer to another school. Fischer, a 6-foot-11 center, was expected to make an impact with the departure of Cody Zeller to the NBA, but in the Hoosiers 13 games he received little opportunities, only averaging 10 minutes per game. Indiana’s head coach Tom Crean said that Fischer is looking for a different fit for him, and it was later reported by JP Cadorin from Time Warner Cable that he was supposedly home sick. It should not surprise many people that he is home sick especially for being so far away from home because many college students have trouble adjusting to the different environment of college. If he is truly home sick, it could be interesting to see what program he decides to transfer to as it would most likely be a program in Wisconsin. The decision just came out today about Fischer deciding to transfer, but when he choses his new team, it will change that program, as he is one of the more talented freshman big men in the country. And who knows, what if he choses the Milwaukee Panthers?